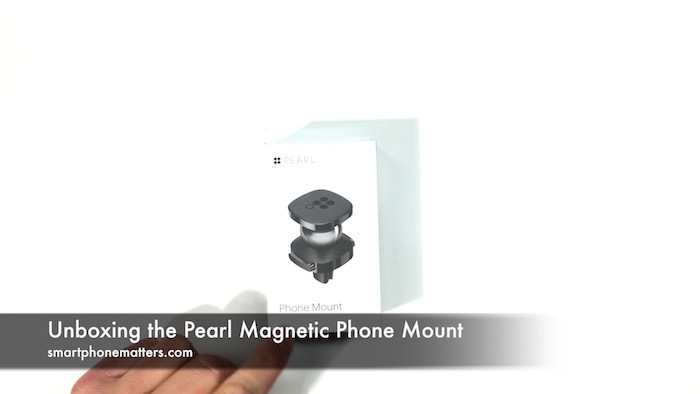 I recently picked up a Pearl Magnetic Phone Mount for my car. Actually both my wife and I replaced our cars in the last two years and both want to be able to mount our iPhones on the dash while driving. Now the Pearl Magnetic Phone mount is meant for use with the Pearl RearVision Backup Camera and Alert System. The RearVison is a add on backup camera for your car that uses your smartphone for the on dash display. Since mounting your phone to the dash is a critical part of the RearVison system I am hoping this mount will do a great job holding our phones in place. Now this mount isn’t cheap, I paid $40 for it on amazon.com. But I figured if we drive to work each day the is four times on or off the mount and over 50 weeks that is over 1000 times on and off the mount per year. So I decided to buy the best magnetic mount I could find and hope its worth it. As I unboxed the mount, I was very impressed with the quality of the box, it is extremely well made. Inside I found the intruction sheet and books, the Phone mount, the dash clip, dash mount, 2 magnetic plates one small and one large, and finally a small wipe for cleaning the dash before applying the dask mount. The phone mount is high quality. It has a metal ball that pivots into many positions. The ball holds its place. The dash clips have two jaws that clamp closed tight, I couldn’t pry them open. You squeeze two buttons on the side to open the clips. The dash clip seperates from the mount and is designed to plug into the dash mount if you prefer to use that. The dash mount is plastic, but must be metal inside and it sticks to the magnetic plate. The back of the dash mount has a 3M adhesive tape you peel off a plastic to adhere to the dash. I took the large metal plate and stuck it behind my iPhone 7 Plus’ case. When I attached the iPhone to the plate it held securely and I was able to shake the mount reasonable hard without the phone moving. To remove the phone you just lift it off. The mount itself is small. The magnetic mount surface is slightly larger that a US quarter. I still need to try this in our vehicles but so far I am impressed.